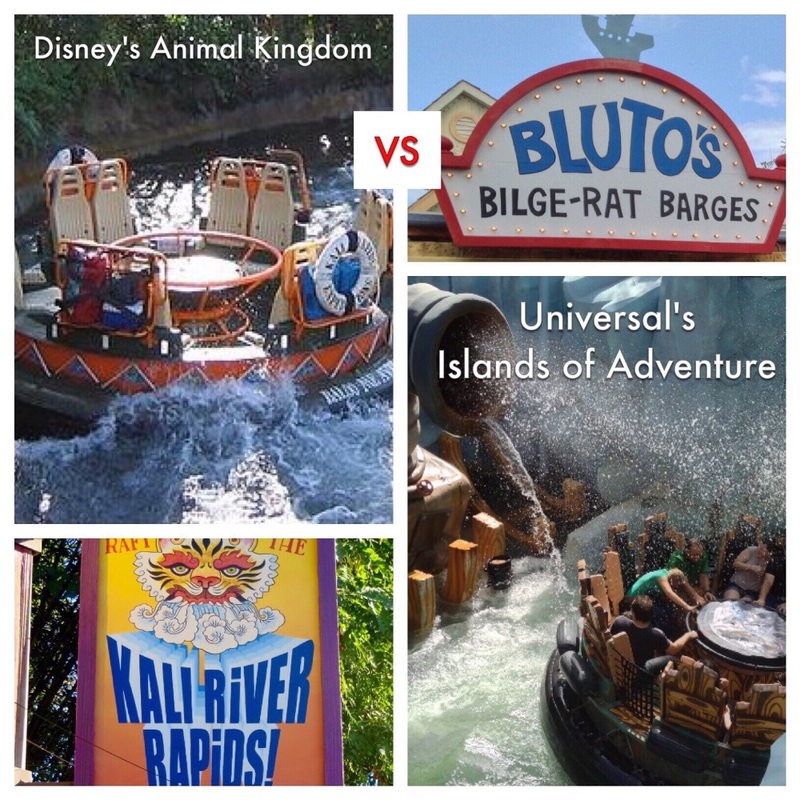 Battle of the Disney World & Universal Orlando attractions: Kali River Rapids (Disney's Animal Kingdom) vs. Popeye & Bluto's Bilge-Rat Barges (Universal's Islands of Adventure) ....which is better? We compare & contrast several aspects of both rides to see which delivers more fun. Kali River Rapids: You must be 38” to ride. Popeye & Bluto’s Bilge-Rat Barges: You must be 42” inches to ride. The winner: For most folks, this won’t matter but Kali River Rapids will have the edge if you have a family member between 38 – 41-inches tall. Kali River Rapids: Lockers near the ride are free while riding. Popeye & Bluto’s Bilge-Rat Barges: Lockers near this ride and Dudley Do-Right’s Ripsaw Falls, another wet ride, but are not free – you’ll pay $4 for the first 90 minutes, and $3 for each hour after that with your daily maximum limited to $20. The winner: Because both of these rides practically guarantee that they’ll soak you to the skin, lockers are a nice option so Kali River Rapids wins here since you won’t have to shell out extra money. Additional information: There is a small compartment with a cover in the center ring of the raft that you can place small items in for some protection. It helps a lot but it isn’t a completely waterproof solution – if you don’t have a locker, definitely bring zipper-type plastic bags to enclose your phone or camera in before placing them in the compartment. You may also want to stockpile some of those silica packets that come in shoes and electronics to put in the bag with your stuff. Standby lines are available at both rides to everyone with admission to the park. Kali River Rapids: This ride is a FastPass+ option – no extra charge but a limited number are available. The winner: Kali River Rapids is my winner in this category because FastPass+ is available to everyone; you may only initially select three (3) FastPass+ options but you can add more, one at a time, once those three are used (subject to availability). Universal’s Express Pass program is included at no extra charge when you stay at one of Universal’s three deluxe level (most expensive) resorts but costs extra – sometimes a lot extra – for everyone else. The winner: Popeye & Bluto’s Bilge-rat Barges because it is almost 25% longer than Kali River Rapids and that makes a big difference. How Wet Do You Get? Kali River Rapids: Most folks will get pretty wet, a few folks may not get as soaked. Popeye & Bluto’s Bilge-Rat Barges: Oh, you’re going to get soaked! The winner: If the goal is to stay dry, stay off these rides; they're not for you! If the goal is to get wet, Popeye & Bluto’s Bilge-rat Barges will get the job done with gusto – wearing a poncho will only keep you less wet, you’re not even going to approach staying dry. Note about your shoes: Both of these attractions will have water gushing into your raft from above and on the floor so your shoes could get soaked and wet shoes increase your chance of blisters. DO NOT rest your feet on the floor – rest them above the bottom of the raft, on the center console. Consider covering slow-drying shoes with plastic bags while you ride. Islands of Adventure has full-body dryer booths available for about $5 nearby. They won't get your clothes completely dry but they will help you go from totally soaked to damp. Kali River Rapids: Definitely the tamer of the two rides, which accounts for the lower height requirement – this one might be preferred by younger riders and timid souls. Popeye & Bluto’s Bilge-Rat Barges: Not only is this a longer ride but it is also wetter and wetter is more better! The ride itself is more exciting too. The winner: Popeye & Bluto’s Bilge-Rat Barges is considered the best raft ride in Orlando by most riders and we agree. Opportunity to soak a stranger: Once you start down the river, you have no control over your raft so you cannot affect who gets wet in your boat but both rides offer bystanders the opportunity to spray water at the riders of the rafts. Kali River Rapids: There are buttons located on the bridge that overlook the ride that cause the elephant statues to spray a stream of water onto the raft riders. The best part is that they are free. Popeye & Bluto’s Bilge-Rat Barges: There are two sets of water cannons available for soaking riders – the first set requires the mischief maker to pay for the experience and are on the bridge by the entrance. The second set is located at the back of Me Ship, The Olive, a Popeye themed play area for kids, and are free. The winner: Both are great! This is great revenge for younger siblings who are too small to ride. Conclusion: Popeye & Bluto’s Bilge-Rat Barges is the clear and undeniable winner of this competition because it is longer, wetter and more exciting. Because of the difference in height restrictions (38-inches vs. 42-inches), younger/smaller riders may be able to experience Kali River Rapids years before they can ride Bilge-Rat Barges and riding is always more fun than waiting on the sidelines so Kali River Rapids may win out with younger families. Rider switch passes are available at both rides for families with a child who cannot or will not ride. This allows one adult to wait with the child while the rest of the party rides, then the waiting adult and at least one other person experiences the ride without having to go through the line when they are done. Click here for more information. Both of these rides shut down when the temperatures get too cold. In cooler month, they will often open later and close earlier than the rest of the park. 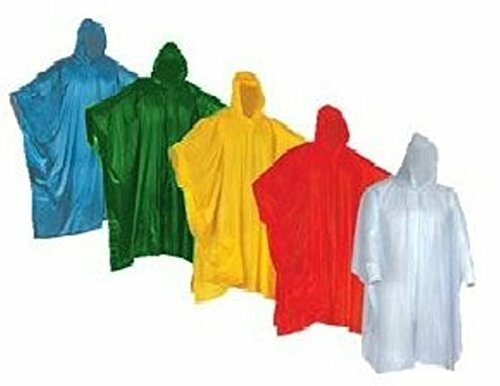 Wealers Poncho One Size Fit All with Hood 10 pieces in display box, 5 different colors •2 Red •2 Blue •2 White •2 Yellow •2 Green. Perfect to Keep in Emergency Kit, Backpack, Home, Office, Car, Pocket, In Case A Rainy Day.